There’s nothing like becoming a mommy, unless it’s becoming a mommy again! 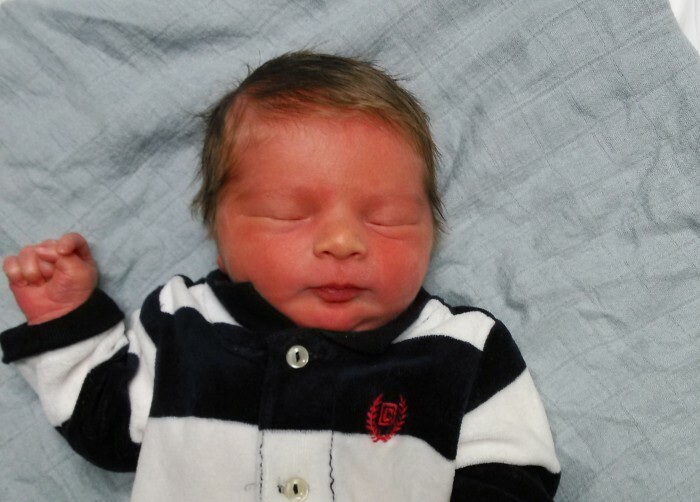 We welcomed our second son Malachi Wray on Feb 6th and couldn’t possibly be more in love. Since I enjoy birth stories and many of you do as well, I’m sharing it below. Keep reading or skip down to the bottom to share your Living Proverbs 31 posts in the linkup! I experienced ICP with my first and 90% of moms who have it once will have it again. We watched my levels closely while pregnant and they did show ICP but very mild. The itching I experienced last time was mild as well (thankfully!). However in talking with my doctor and praying about it (lots of praying, although I tried hard not to stress) we felt that given the nature of ICP it would be wise to induce early this time as well. Induction started Thursday around noon with the placement of cervidil (to prep cervix for labor). We brought Kolton with us to the hospital that morning and the 3 of us just hung out and had fun in the room while monitoring contractions. Jason put Kolton to sleep and laid him on the bed beside me and I took a little nap with him. It was at this point that we learned I couldn’t lay on my left side because it did funny things to baby’s heart rate. Fine by me, I hadn’t been able to sleep on my left side most of my pregnancy anyway. It was too uncomfortable. Somehow I wonder if it didn’t bother baby all along and my body picked up on that. Contractions increased in frequency and intensity during the afternoon/evening and my mom was supposed to come pick up Kolton so he could stay with her during that time. However, my poor mom got sick and Kolton ended up going home with an Aunt instead. The cervidil came out at 1am and they thought I should rest before inserting another one (we used two with my first and I went into labor just from that). So I “rested” until 7, ate breakfast and showered before starting agin. Nothing much happened Friday. Very uncomfortable contractions, mostly in my back and my doula came with the focus to help my labor progress with natural methods and get baby in a better position. Sadly enough I didn’t progress a bit. Baby did change position though, but not sure it helped. As well, when I would sit straight up his heart rate went from 120-160 all the way down to 90-110. Very strange and somewhat concerning. No more sitting straight up for me. I could recline on my back, lay on my right side, or walk (later walking made his heart rate drop too). 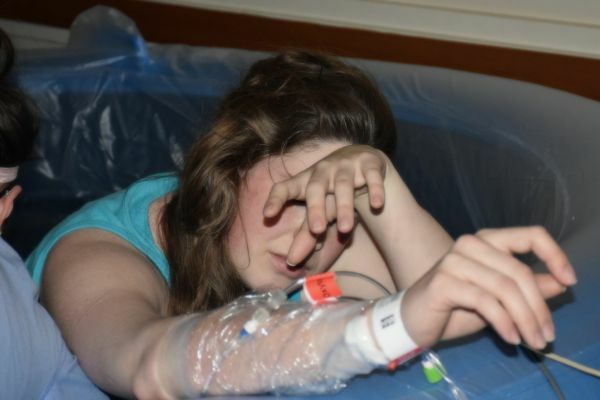 I wanted badly to avoid a pitocin labor but that became unavoidable. We started pit Friday evening and really hoped things would speed up but it was not to be. Saturday morning, Jason ran home to spend a little time with Kolton and get a few things. At 10am we got discouraging news that in spite of my uncomfortable night I hadn’t progressed a bit. I sent my doula home to get a few hours of sleep. By the time Jason returned though my contractions were definitely picking up and it was clear I was in for more back labor if baby didn’t turn. Labor became more and more painful and nothing was working to move baby. Around 3 things were so painful and the contractions were quite regular even though still 1-4 minutes apart. They checked me and I hadn’t progressed hardly any. I lost it and cried. Between the pain and the hormones it was all I could do to get control of my tears again. 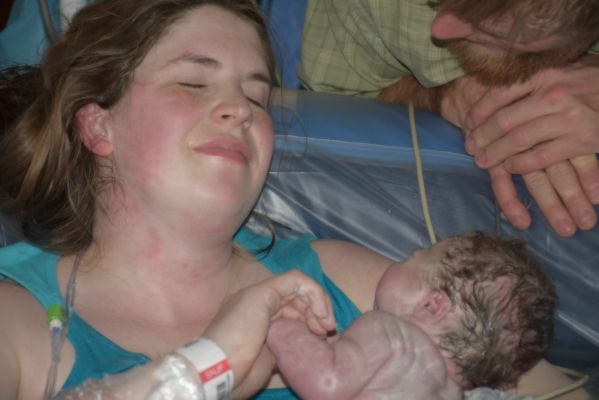 My doula came back around 6 and at that point it was full-blown labor even if I hadn’t progressed much. She explained that I was much too tense and started helping me by using verbal cues to get through the contractions. I’ve had back labor and it’s no fun. However Pitocin induced back labor made my natural back labor look like a walk in the park. I honestly couldn’t have done it without my doula. Needles scare me so an epidural wasn’t even an option. After my huge disappointment earlier that afternoon I was scared to have them check me again as I didn’t think I could handle being told I hadn’t progressed again. But around 8pm they checked me and I was at an 8 and the head was right there! I got in and immediately felt my body relax. The contractions still hurt but nothing like before and then I realized it was time to push! Unlike my first labor where I pushed for over 2 hours, this time it was maybe 2 pushes! I was taking it easy, remembering how my tailbone broke last time. But after I heard it break again, all bets were off and I pushed him out. So fast in fact that they weren’t hardly ready to catch him. I said “head’s out” and there was a lot of scrambling around! And Malachi made his appearance at 9:30pm Saturday night. A long slow start, but really less than 12 hours of active painful labor. Recovery for me is taking a bit longer, but I am so blessed and thankful that Malachi is here safe and sound. I’m not one to push for early inductions, but this ICP stuff isn’t a joke (15% or more increased chance of stillbirth with ICP) and I still feel we made the right choice. Malachi was born right at 38 weeks. He is small for the babies in my family, 7 pounds 8 ounces, but is doing quite well and big brother is in LOVE! As are we all. Love this photo. He was there with me the entire time, my quiet support. Sweet friend! Congratulations!!! Malachi is absolutely gorgeous, and you are save a brave lady for bringing him into the world so courageously! I’m beyond proud of you!!! Congrats! Thankful for a safe delivery! Love hearing birth stories!!!! Water birth sounds amazing. But an epidural is not that bad. It actually hurts less than pitocin contractions. Take my word on it. Well the point of the epidural is to numb the pain, so I’m sure it would hurt less. However I try to avoid all use of drugs. I did my best to avoid pitosin but it couldn’t be helped. 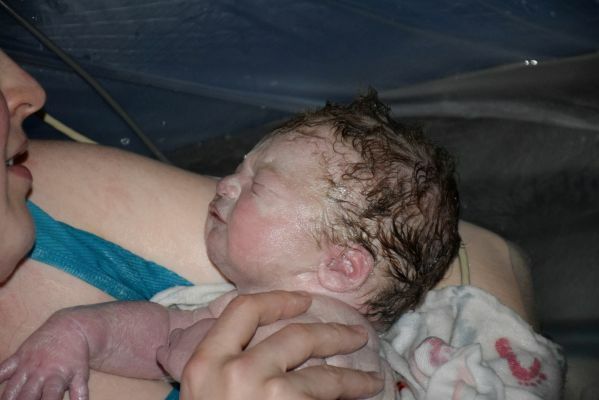 All the same, a water birth is amazing! Sorry previous comment of mine had a mistake on my blog name. I hope you have a great recovery! I’m so happy for your family. He’s adorable. Love the photos. What a treasure you have. Be blessed and sleep well when you can! Congratulations! Oh my gosh. Cute, adorable angel. Oh those pictures are so sweet! Congratulations on your new baby! Oh and by the way love the name! May God richly bless your new life with Malachi and make him a mighty man of God. Congratulations! Thank you! That is our prayer for him as well. Thank you for sharing your birth story! I cringed when I read you weren’t progressing and fell apart. I can so relate. When my midwife arrived for my last birth, I told her up front, “You are going to examine me and tell me I am at 4 cm and I am gonna fall apart. I’m just warning you now.” It didn’t play out that way, but I was highly anticipating it because of previous births. So glad it all turned out so well! And he is beautiful! That hair! Those cheeks! The admiration your husband feels for you is evident in his eyes. Enjoy these new baby days. Congratulations! He is absolutely adorable! I’m sorry you didn’t progress for so long. But, glad that once things got going it went fast. 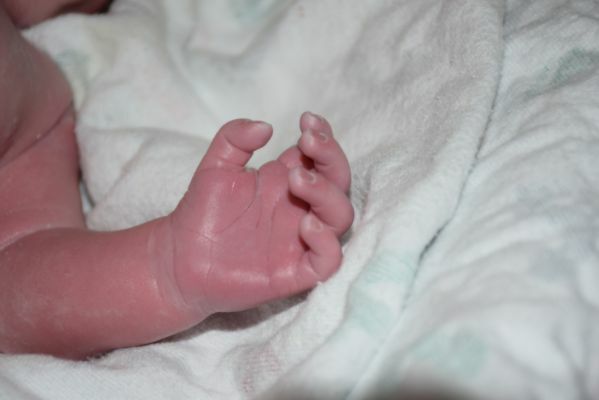 Thank you for sharing Malachi’s birth story. I look forward to seeing pictures of big brother with his new baby! Congratulations! I am so excited for you and I am glad your little man is here safe and sound. Enjoy this precious time! It’s such a JOY to have a child yes pain, but so well worth it. I had three. The pain leaves so quickly when you first see that precious child well almost quickly, but God gave us a great gift with having children. … Oh Congratulations my sweet friend in Jesus. My Joy is my grown children, and now my grandchildren. Our heavenly father has blessed me so very much even though I’m ill. Thank you so very much for sharing your story. Beautiful children also. I can see your husband loves you dearly. He is so beautiful, Momma! Great job, loved reading your story. Hate all tou had to go through, though. I always wanted to try a water birth and if my insurance will cover it I may try it next time. Congratulations on your handsome Little Man! A water birth doesn’t cost any more around here. I just asked for a pool in my room and they get me one. I think it may depend on your hospital more than your insurance but definitely look into it!